The president wasn’t in the room, but he was omnipresent as congressional hopefuls tried to convince a crowd in El Sereno that he or she has what it takes to represent their interests in the era of Donald Trump. 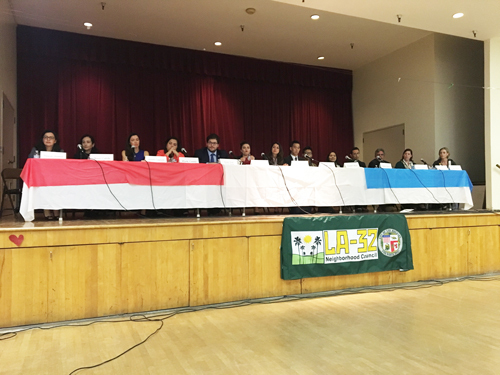 Fourteen of the nearly two-dozen candidates running for the 34th Congressional seat left vacant when Xavier Becerra left to become State Attorney General took part in a candidate forum Feb. 28 at the El Sereno Senior Center. The seat will be filled during a Special Election on April 4, but if no candidate receives 50% plus 1 of the votes, a runoff between the two top voter getters will take place on June 6. The 34th Congressional District spans some of Los Angeles’ most ethnically diverse and densely populated neighborhoods, running from Boyle Heights, through downtown and Northeast Los Angeles, Koreatown and the Westlake area. Cheers, jeers and applause that often interrupt speakers at these type of forums are commonplace, but the dozens of people gathered last week appeared more intent on listening to the issues being discussed than rallying support for a single candidate. Noticeably missing was Democratic Assemblyman Jimmy Gomez, who some see as the frontrunner — and candidate favored by the Democratic Party establishment. Gomez’ campaign said the assemblyman had a scheduling conflict. “We need somebody who knows how to fight, when to fight and how to be effective,” said Vanessa Aramayo, an anti-poverty, nonprofit advisor, after first describing her experience with public policy and community organizing. For some of the candidates, like aerospace engineer Tracy Van Houten, the desire to run was fueled by Trump’s appointments to his Cabinet. “I cannot stand by and watch and see what Betsey DeVos will do to our public education” system, she said, before going on to tout her experience sending rovers to Mars. Raymond Meza, a coordinator with Service Employees International Union Local 721, described how he successfully rallied support for an increase in the minimum wage. He argued that towing the Democratic Party line is not enough, because “If that’s all they’re going to do, nothing is going to get done. Pointing to the president’s recent executive orders on immigration, several shared stories of growing up with immigrant parents or being immigrants themselves. They said the issue is personal to them and the district’s large undocumented immigrant population. Journalist and community activist Wendy Carrillo migrated without permission to the U.S. to escape the civil war in El Salvador and later became a citizen. She warned that recent Immigration Customs Enforcement (ICE) raids have made many immigrants fear the police. “We need to ensure federal funding is not used to give local authorities jurisdiction to act as ICE agents,” Carrillo said. Maria Cabildo, an economic development director with Los Angeles County added that the raids are having a chilling effect on the economy. “During the [George W.] Bush presidency we saw foreclosures in our community, that could potentially happen again,” she warned. Campoverdi compared the fear she’s seeing to that experienced after the approval of Proposition 187, which would have prohibited undocumented immigrants from receiving public benefits but was for the most part blocked by the courts. “That’s why we need political pressure, to lay the groundwork for immigration reform, not just a Band Aid,” she said. Kenneth Mejia, a certified public accountant and the sole Green Party candidate, reminded the crowd that millions of people were deported under the Obama Administration. He said he’s against Trump’s border policies: “If we can open borders to billion-dollar companies, we should open borders to people,” he said. As an immigrant who arrived to the United States as an unaccompanied minor, public administrator Sandra Mendoza called for temporarily housing if children are separated from their parents during such raids. Steve Mac, a felony prosecutor and military officer, suggested cutting funds to ICE as a way to limit deportations to violent criminals. He said slowing down hearings before judges would force ICE to prioritize who they go after. Trump’s plan to “repeal and replace” the Affordable Care Act should also be a top priority for whoever is elected, the candidates said. Tenaya Wallace, a civic engagement strategist, said ending Obamacare will be detrimental to many in the 34th District and whoever goes to Washington D.C. must be able to tell their stories, pledging she would “hold the line” on repealing the law. Hernandez called the race an investment in the next generation of leaders, in someone who will stand up for the values of the community. Hearing Trump insult his heritage was enough to prepare him to go face-to-face with the president, said businessman William Rodriguez-Morrison, the sole Republican in the race. For Carrillo, there is a need to create a movement that will bring change come 2018, when mid-term elections could put control of the Congress back in play. Before he left, Becerra was the highest-ranking Latino in Congress, serving as Democratic Caucus chair.